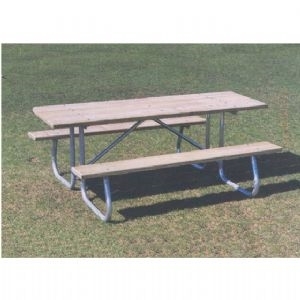 6 foot Rectangular Picnic Table, Wooden Planks w/ Welded 1 5/8" Galvanized Steel, Portable, 199 lbs. 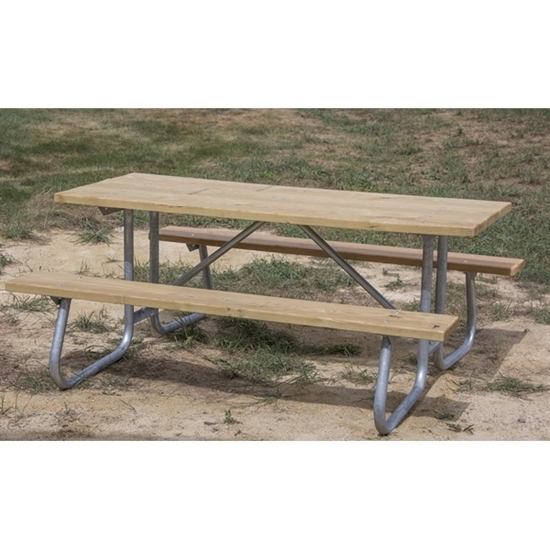 This 6' 'CJ' rectangular picnic table is made with sturdy galvanized 1 5/8" O.D. schedule 40 pipe, a wide tip resistant design which is welded for rigidity & then hot-dip galvanized. Top & seat cleats are 2 x 2 x 3/16 inch steel angles. Center cleat is 1 1/2 x 1/2 inch steel channel which provides level top & sturdier attachment of the 1 5/16" galvanized cross braces. Top & seats are pressure treated Southern Yellow Pine. Portable for convenience.